Doctor Parish is a graduate of Tufts University School of Medicine and completed his dermatology training at the Hospital of the University of Pennsylvania. 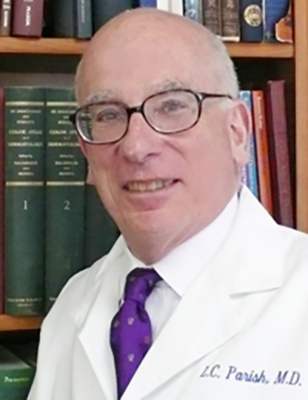 He is Clinical Professor of Dermatology and Cutaneous Biology and Director of the Jefferson Center for International Dermatology at Sidney Kimmel Medical College at Thomas Jefferson University in Philadelphia and holds visiting professorships at Tulane University, New Orleans, LA, Zagazig University, Egypt, and Yonsei University, Seoul. In addition to membership in the American Academy of Dermatology and the American Dermatologic Association, he is President of the International Academy of Cosmetic Dermatology and the History of Dermatology Society. He is also Editor-in-Chief of Clinics in Dermatology. His interests include the history of dermatology, gender dermatology, tropical dermatology, infectious diseases of the skin, and wound healing.